On Family Guy Season 16 Episode 20, after falling into a coma, Peter meets God and asks some pressing questions about life. Read on for more! On Family Guy Season 16 Episode 19, Ida comes to the rescue after Quagmire loses the most precious part of his anatomy. What happened and why? Read on! On Family Guy Season 16 Episode 18, Peter tries his hand at being a Millennial but makes a huge mistake that turns the Millennial world upside down. On Family Guy Season 16 Episode 17, Stewie tries to change Brian's life by switching bodies with him, but havoc ensues when the machine goes haywire. On Family Guy Season 16 Episode 16, the show is reimagined in a special retrospective taking us through the 50s, 60s and 70s. Read on for more! 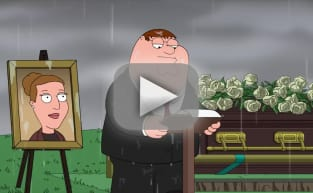 On Family Guy Season 16 Episode 15, Brian makes a bad choice after Stewie shows him the ways of Wall Street while Peter and the guys take over the Clam. On Family Guy Season 16 Episode 14, Peter and the guys must join the Coast Guard after pretending to be veterans. What kinds of chaos ensues? Read on! On Family Guy Season 16 Episode 13, Stewie and Brian become Holmes and Watson and set out to solve a murder mystery in merry old England. Read on. On Family Guy Season 16 Episode 12, Stewie visits the school psychologist in what could be the show's worst episode of all time. Why? Read on. On Family Guy Season 16 Episode 11, Brian and Stewie bond after an unfortunate incident happens with Rupert. Meanwhile, Peter meets Boo Berry. On Family Guy Season 16 Episode 10, Peter and Lois tell Chris the truth about the fictional Arthur Valentine, but it's not that easy. Read on! On Family Guy Season 16 Episode 9, Peter learns about the Christmas Spirit when he takes a journey through Christmas past, present and future. Read on.